This was another family favourite, until my brother and I became vegetarians! However, to make it a vegetarian recipe simply used minced quorn instead. 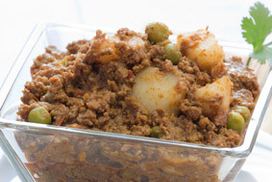 Wash the minced meat thoroughly in a colander at least 4 or 5 times and allow it to drain. Cook all the ingredients in a large saucepan, leaving the peas and potatoes and fresh coriander on the side. Cook for about 30 mins adding a cupful of water. Once the water is dry, constantly stir for about 5 minutes. Then add the peas and potatoes and a little water. Keep stirring. Once everything is cooked add in the fresh coriander. Enjoy with naan or chapatti bread.